MAMMAMIA is a line of products inspired by Italian tradition. They are dedicated to those who love the flavour and authenticity of homemade food, and want to rediscover their passion for the art of cooking in their own kitchens following only a few simple steps. 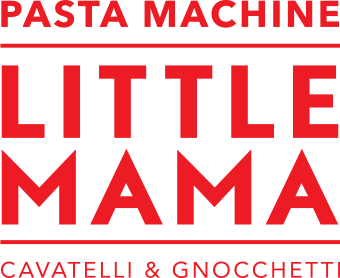 BIG MAMA is the pasta machine you can rely on when time presses. Spaghetti and tagliatelle, cavatelli and gnocchetti will be ready to serve with your favourite sauce in just a few minutes and following just a few steps. We are all chefs in our kitchens and each chef has his specialty! Send us your recipes together with photos and discover every week new delicacies on MAMMAMIA’s blog, online soon. LITTLE MAMA brings two delicacies of Mediterranean cuisine to the table: cavatelli and gnocchetti. They are quick and fun to prepare, and are tasty, flavourful dishes great to share with your friends.